So maybe you've heard of this band called HEALTH? I know I've mentioned them a couple times. 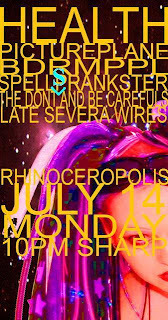 Well my band, The Don'ts and Be Carefuls, has the great honor of being able to play with them this evening at Rhinoceropolis. Doors are roughly 9PM, show will start roughly around 10PM. As always, there's a $5 donation. This evening is going to be freaking awesome. All the other bands (Pictureplane, BDRMPPL, Spellprankster, and Late Severa Wires) are also always a trip to see.